Mick Jagger once told Rolling Stone magazine that the Rolling Stones ultimately “won” in any battle with the Beatles because his group continued to record longer. But after seeing Paul McCartney and the Rolling Stones perform this year, I think it’s hard to agree with that assessment in 2013. Whereas strained relations between Jagger and Keith Richards made for an occasionally lackluster Stones performance in my view, McCartney was simply riding high in his performance at Nationals Park on Friday, July 12, for his “Out There” tour. 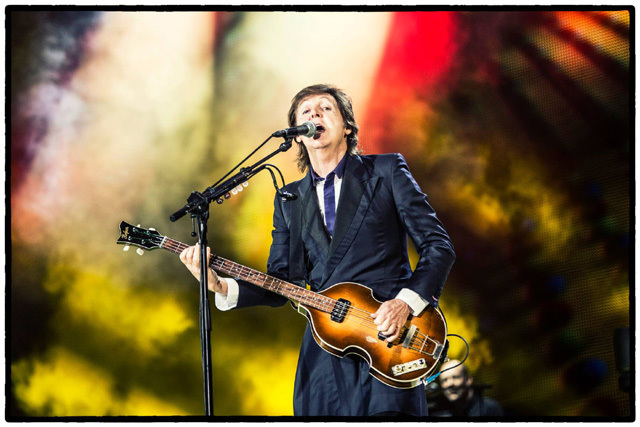 For the size of the stage, McCartney’s five-piece band, including himself on guitar, seemed elegantly and effectively simple for the scope of the sold-out ballpark. Wry and earnest, McCartney charged through a catalog of songs by the Beatles, Wings and himself with incredible charm, skill and workmanship. 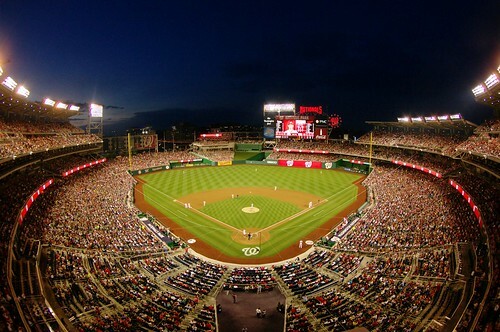 That is one great shot of Nationals Park! Phil employed his trusty fisheye lens to get nearly the entire seating bowl of the stadium into one shot. A fisheye lens is an ultra wide-angle lens which gives a 180 degree view. It’s a fairly specialized lens, and few photographers use them. This is mainly because the distortion that is created can become a tiresome effect and people lose interest in using it. 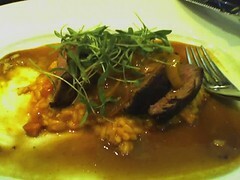 Also, such a wide-angle lens is not useful in most situations. However, when employed properly, like the shot above, the results are outstanding! Welcome to the dog days of summer in Nats Town. The Nationals start a nine-game homestand tonight; they’ll play three series against NL East foes, and they’ll need to come out 6-3 if they want any shot at making a run at the Wild Card. Unfortunately, I don’t see that happening, but there’s a good solid chance at 5-4, if they play their cards right. Here’s the full preview of the homestand that brings us fish, the Braves, the first start of the season for one Washington pitcher, and a Jayson Werth Bobblehead doll. There’s a scene in the 1992 movie “A League of Their Own” where catcher Dottie Hinson, played by Gina Davis, her younger sister Kit and their future teammate Marla Hooch first set foot on the warning track of the fictional Harvey Field for the first-ever All-American Girls Baseball League tryouts. It’s that first glance inside the hallowed grounds of what is traditionally known for being a “Men’s Only Club” that filled their eyes with a child-like sense of wonder. It’s kind of like the first time anyone, no matter their age, sets foot inside of Disney’s Magic Kingdom in either California or Florida – it’s fulfilling a fantasy. In this case, a baseball fantasy. That’s what Nats U for Women is akin to. 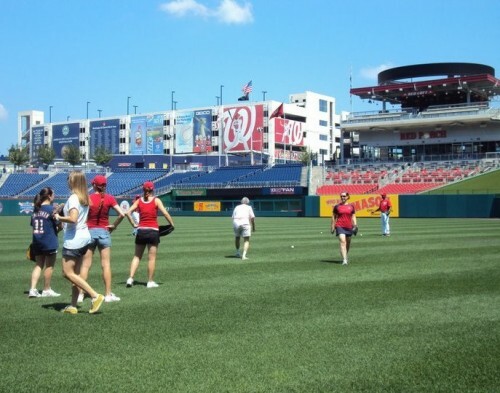 Nats U is by no means a big league tryout for women to make Washington’s squad but stepping upon the sacred grass (that is always restricted territory to fans) is an indescribable feeling. Most women in attendance attribute the program’s success to being a unique event for them to participate in together as fans of the Nationals and of Major League Baseball. There are few things that say summertime quite like baseball. With the long weekend coming, the Nationals (21-28) return home for a six-game homestand against the Padres (20-30) and Phillies (31-19). The road trip wasn’t as kind to the Nationals as the previous one, with the Nationals going 1-7 across three cities, and playing some pretty dismal baseball. It’s clear that the Nationals are in for some interesting times. But, there’s some good reasons to hit the ballpark this time round. Welcome to the sweet spot of the baseball season in Washington, when the weather is perfect, the team is playing good cohesive ball, and there are enough deals and giveaways to make a night at the ballpark sound absolutely redeeming. 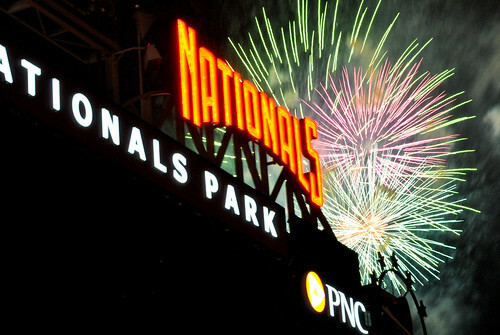 The Nats come home this Friday night for a short but sweet five-game homestand. There’s a lot to look forward to, for the dyed-in-the-wool fanatic, and the casual fan. Read on. 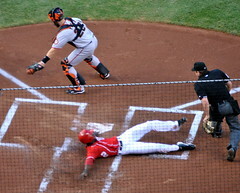 Cliff Lee, much like Roy Halladay on Wednesday, was a force of nature that the Nationals just couldn’t contend with. Lee racked up 12 strikeouts in a complete game shutout of the Nationals to close out the opening series against the Phillies in front of 24,875 mostly Philadelphia fans on a perfect April evening. 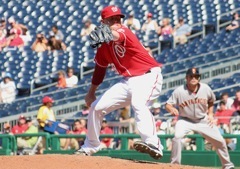 The Nationals had two strong chances against Lee, but managed to make a hash of both of them. Sadly, this was their night to waste a great start by Jordan Zimmermann, who was perfect through five, and went 7+ and allowed just 1 earned run, striking out 4 and walking none. Talk about an empire. DCMud.com reports that restaurateur Ashok Bajaj, the man behind Bombay Club, 701, Rasika, and Ardeo + Bardeo could soon sign a lease for the retail space at 22 West in West End. Bajaj somewhat hinted at a new project in a chat last month with my fave food critic, Tom Sietsema. My favorite news of the week comes via The Washington Post: Whole Foods Market and a D.C. real estate firm want to build a new store in Navy Yard, “but the developer says that luring the grocer would require $8 million in tax breaks.” WaPo reports that William C. Smith and Co. is proposing a 39,000-square-foot Whole Foods in the 800 block of New Jersey Ave. SE as part of a building that would also include 375 apartments. The baseball season is over and done with. Hockey starts Friday, and Basketball in a few weeks. The beginnings of winter are incumbent upon us to respect, and the end of the baseball season is a part of that winterizing process. This was a season of growth for the Nationals in many ways, and there’s a lot to respect in terms of significant process. There’s also a lot that we’ll have to see changed in order for this to become a contending franchise in the next decade. This is a turning point for the Nationals, and there’s a real opportunity for this club to take what it’s spent the last five years working on and put it to good use. The Nationals are not a complete franchise, right now, but in two or three years, they could be a .500+ club with a shot at the Wild Card. Will they get there? I hope so, but I fear for the worst. Losing the head of their front office will be a big test for this club that has relied upon his experience so extensively. There is, as in many cases, both crisis and opportunity in this change. The Nats finally have a solid GM in place, someone who can handle baseball operations and contract negotiations without giving away the farm, in Mike Rizzo, and the addition of Andrew Feffer as the Nats’ Chief Operating Office this past off-season gives them someone who understands the intricacies of running the ballpark operations side of things for the Nationals. 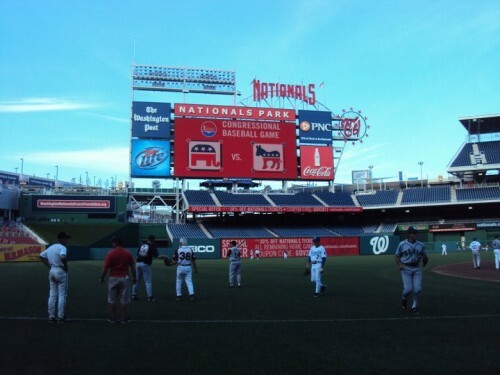 Stan Kasten is right: DC could be a baseball town. There’s an audience, yes, but they’re going to have to be shown that the product’s worth watching. This season? It was too volatile to promise to a good audience. If the Nats want to draw 2-2.5M fans each year, they’re going to have to put out there something that people want to watch. And generally speaking, those people shouldn’t just be in from out of town. Let’s take a look at the lineup this season and see how everyone did, shall we? Ross Detwiler was read like a book on Wednesday night’s home closer at Nationals Park, and the crowd of just over 20,000 watched four home run balls sail out of the yard to propel the Phillies to a 7-1 victory. It was a cool evening at Nationals Park, but that didn’t bother the Philly bats, as Mike Sweeney, John Mayberry Jr and Ben Francisco (twice!) sent balls out of Nationals Park. 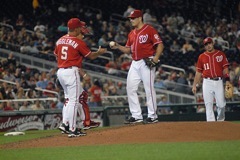 Sadly, the Nationals couldn’t muster much offense against Joe Blanton and the Phillies. The Nats would eke out one unearned run in the fourth when Nyjer Morgan would get to third on a single, a ground out and a throwing error, and score on a ground out. Twice the Nats would leave runners on 1st and 2nd despite getting them there early in the inning, but conversions were sorely lacking. Adam Dunn would disappoint the fans cheering for a re-up in his contract with four strikeouts against Phillies pitching, including a bizarre situation in the first where Ed Hickox had to explain to Dunn that he’d struck out. Despite that, the crowd gave Dunn a standing ovation for his service in Washington, and a proper hope-to-see-you-this-Spring. Dunn’s re-up is a little contentious with the front office, and negotiations are likely not to pan out. There’s much to discuss regarding the Nationals’ future, but there are still three games left to play in New York. We’ll have some season-wrap-up features here in the next week or so. The Nats have shown immense potential this season. At some point, the team will have to step forward toward greatness, or resign itself to mediocrity. Mediocrity can still draw 1.8M fans a season, and at $40 per seat, on average, that’s a good sum of money just on ticket sales. DC deserves more. Here’s hoping they can get it. We had a unique opportunity to be some of the first bloggers in the press box in any major league baseball environment this season. I just want to say thank you to Mike Gazda, John Dever, Bill Gluvna, Kyle Brostotowitz and Lisa Pagano for working with us to make this happen. It’s been an incredible experience, and I hope we get to repeat it for you next season. The Nats have a hard choice right now. Jason Marquis’ last two starts are little better than his April ones. Tonight he pitched just 4 innings, but gave up 5 runs on 7 hits, walking 2 more. Asked after the game tonight, manager Jim Riggleman said, “his sinker just wasn’t down.” It showed. Miguel Montero blasted him for a 2-run homer in the 2nd, and Gerardo Parra added a solo shot later in the inning. That would be all the Diamondbacks would need, but they kept up the offense just to stay engaged. Kelly Johnson added a homer in the third, and Montero slapped a second bomb in the fifth. Riggleman wasn’t comfortable talking about Marquis’ fate tonight, but one has to think the Nats have to be thinking about what possible utility he has at this point. 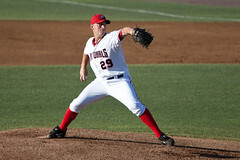 There aren’t a lot of options for them down in Syracuse, and Jordan Zimmermann isn’t quite ready yet, nor are Yunesky Maya or Chien Ming Wang. Gary Carter showed up at Nationals Park Tuesday to help the Washington Nationals honor his former teammate. Much to his surprise, the Nationals hadn’t reserved all of the night’s festivities for 2010 Hall of Fame inductee Andre Dawson – he too would be recognized. The Hall of Fame Ring of Honor is a display of player’s names atop the Lexus President’s Club seats behind home plate. 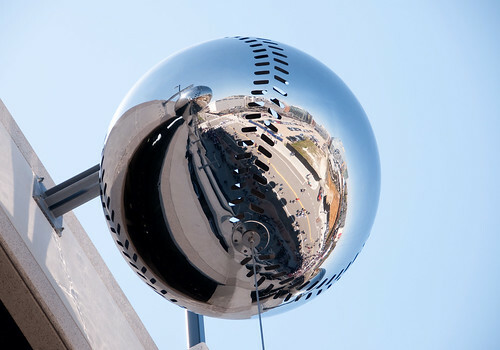 It was installed this week as a reminder of baseball days gone by and a step toward ensuring that Nationals fans of the future know where their beloved team came from. Dawson and Carter are just two of the names inscribed inside that ring. Pictured: The Zimmerman family (Ryan , Cheryl, Keith, and Shawn). 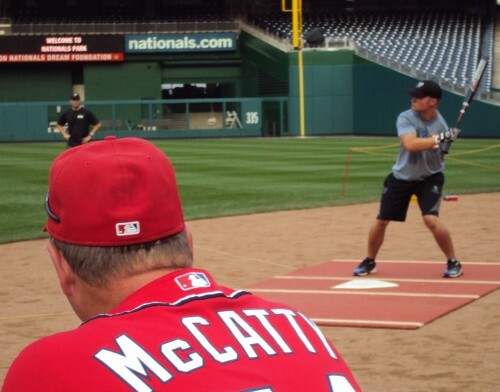 Nationals Park played host to Ryan Zimmerman’s “A Night at the Park” on Monday to raise money for the the ziMS Foundation. 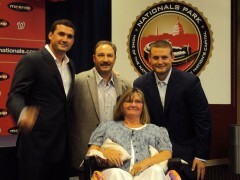 The ziMS Foundation, which was started by Zimmerman to benefit multiple sclerosis research, was inspried by his mother Cheryl who was diagnosed with the disease in 1995. The entire Zimmerman family including Ryan’s mother, his father Keith, and brother Shawn were in attendance for a night of live music from Mutlu and Amos Lee, magic from David Blaine, and both live and silent auctions. 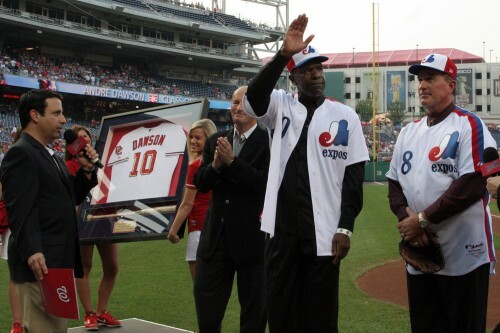 The Nationals announced Tuesday afternoon that the team will be honoring 2010 Hall of Fame inductee Andre “The Hawk” Dawson, who played for the franchise in Montreal with a tri-colored Expos cap atop his head from 1976-1986, on August 10 at Nationals Park. It’s easy to fall victim to making a quick comparison between the Washington Nationals and the Washington Senators since those are the only two ball teams to play in the District, but they’re not one in the same. In fact, they’re far from it. The Senators were an American League team. The Nationals are a National League team. The only common ground is the city in which they played. 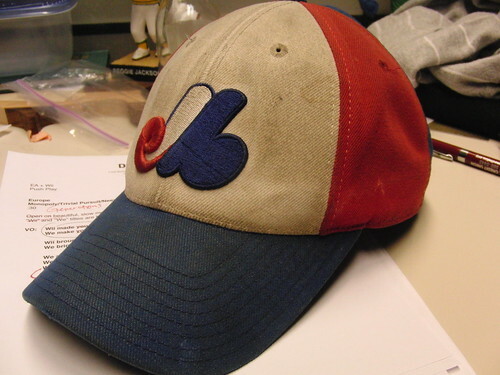 Here’s a closer look at the Nationals’ history and how the Expos fit into that. 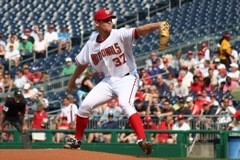 Looking for the sweep today, the Nationals brought out their ace, Stephen Strasburg, to cement a winning streak and build some momentum, going into the weekend series against Baltimore. Sadly, the team’s offense couldn’t deliver, in a game fraught with mistakes and misplays, in some cases over-sliding bases, and in others sliding too early, and they fell without scoring, 1-0. 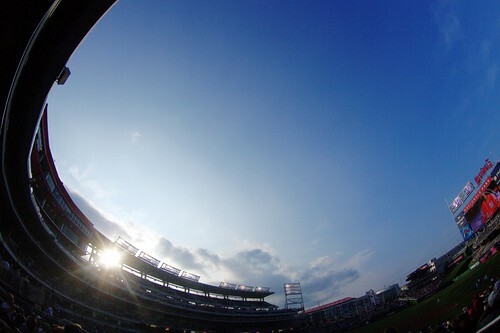 A humid Washington evening in the early days of summer is a bit of a difficult environment for baseball. You never know when a storm will break out. Tonight, the Royals were the recipients of a pair of storms: one from the Nationals’ bats, and the other from Mother Nature herself. A 49-minute rain delay couldn’t shake Luis Atilano, who picked up his sixth win of the season in 5 1/3 innings. Tyler Clippard and Matt Capps would do their eponymous routine on Clipp & Save T-shirt night here at Nats Park.